As I often talk about hair care and share my favourite hair products with you guys, it got me thinking that I don’t ever go further than that by showing you how I use the products and how I create my everyday favourite go to hair looks, as I love watching/reading easy hair tutorials, especially ones that take as little as 10 minutes. I thought it would be fun to switch things up a little and show you how I create my favourite three go to hair looks, in collaboration with L’oreal and Preen.me, using the new L’oreal Studio Pro styling range. The new L’oreal Studio Pro range is all about switching up your everyday hair styling routine, by reinventing your looks using their new range of products to do something new and out of the norm with your hair everyday! With five products that can be used in a number of ways to create so many different hair looks, the possibilities are endless. 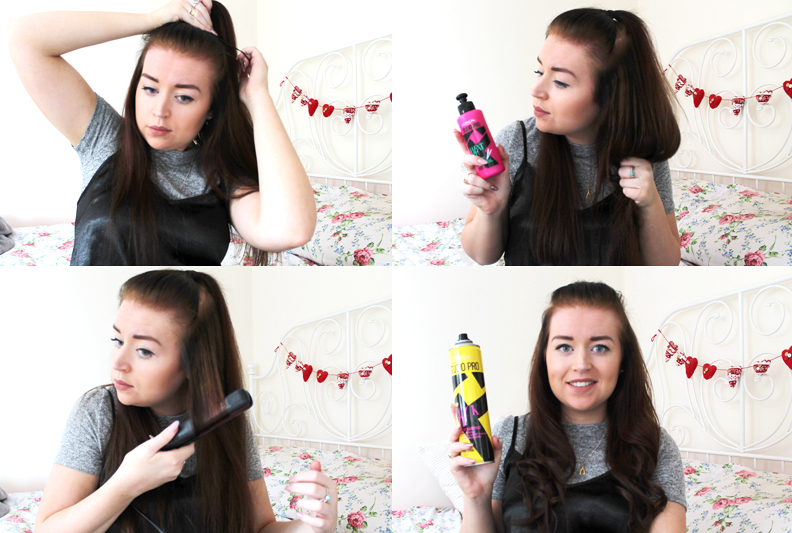 As I was lucky enough to get to try out the new range, I thought i’d test out the products on some of my favourite hair looks as I often find they fall flat due to lack of styling products or in pure laziness I wouldn’t bother styling my hair at all, so I thought i’d see how these products worked and also show you guys too! My favourite thing to do with my hair is to give it a good curl, as I love how my hair looks when it’s curly but because my hair is quite long and also fairly dead due to a lot dying, the curls always drop out after an hour or so. I started off by brushing through my hair and applying the L’oreal Studio Pro Heat It Up Hot & Straight Spray* (£4.49), as I love a good heat protection spray and this applies really nicely, and evenly to the hair without leaving it feeling sticky or greasy as I find a lot of heat protectants do. I then followed by using the L’oreal Studio Pro Curve It Curl Mousse* (£4.49), which is great for giving your curls the hold that they need and also gives your curls that definition that I find my curls often lack. I applied through the mid to end lengths of my hair, whilst it was still damp and allowed my hair to air dry. I then went in with my Babyliss Studio Pro Curling Wand (£25) to create some bouncy curls, and I absolutely love this curling wand as you can create so many different types of curls with it. I only tend to curl the mid to lengths of my hair, keeping the top section fairly straight as I find my hair can resemble a poodle otherwise. Once i’d curled all of my hair, I finished this look with the L’oreal Studio Pro Lock It Ultra Strong Fixing Hairspray* (£4.49), which I absolutely love as it locks your hair in place but it doesn’t leave your hair feeling stiff or feeling like you’ve got a tonne of hairspray in it! And that’s the finished look! I was so pleased with the results after using these products, as my hair didn’t feel at all damaged after curling my hair and the curls themselves looked uh-mazing for the remainder of the day and lasted pretty well the following day also! When i’m being completely lazy with my hair I will usually just let it air dry, and I find after blow dry styling to be such a faff and I find my hair just looks so flat when I blow dry it, but I thought i’d see how these products could work to make my hair look sleek but with some added volume after blow drying my hair. 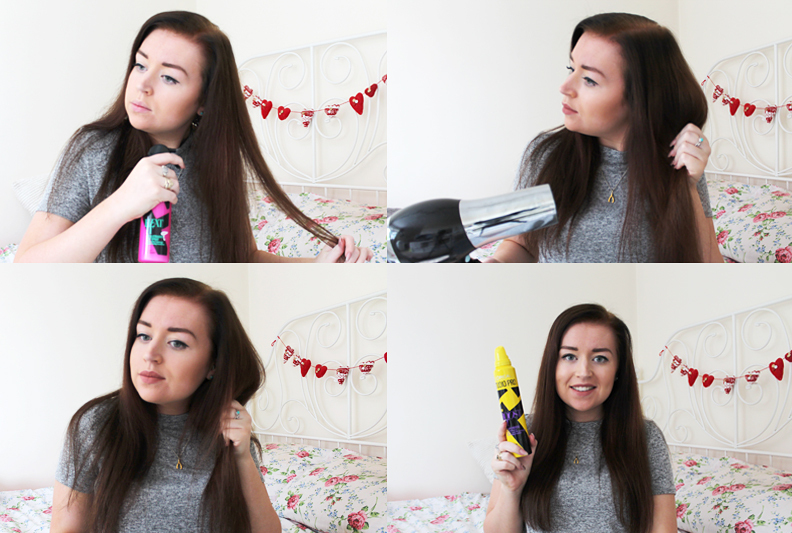 I started off by using the L’oreal Studio Pro Heat It Hot & Straight Spray* (£4.49) as I loved it so much from the first look, and I wanted to see if it lived up to it’s name as this is meant to be used for a straight hair look. I then used the L’oreal Studio Pro Boost It Volume Mousse* (£4.49) and scrunched this into the top sections of my hair whilst it was still damp to help create some volume at the root section. I then went straight in with my blow dry using my old yet trusty Remington Hair Envy Hairdryer and using one of my tangle teezers to blow dry it as straight as I could and it’s safe to say I was fairly impressed with the results, as my hair usually looks like an absolute frizz ball. I then went back in with the mouse to finish off the look, to just add a little more volume, again scrunching this into the top and mid sections of my hair. Safe to say I was really pleased with this look! It took literally 10 minutes, with barely any after styling and I loved the added volume into the root section of my hair, as i’m so used to my hair look really flat after a blow dry. The third and final look is my go to hair style, the half up half down pony tail as it’s so easy to do, and it makes your second/third day hair just look that little less miserable. I thought i’d switch it up a little and add some waves into this look, to see how they lasted throughout the day as waves never stay put in my hair. I started off by teasing the top section of hair up into a pony tail and I secured that with a hair bobble, and messed around with it until I was happy with how it looked. I then applied the L’oreal Studio Pro Heat It Hot and Sleek Heat Protection Cream* (£4.49), which I was skeptical about using as I find creams really weigh my hair down but this spread through my mid to end lengths like a dream. I then used my very old and battered FHI Hair Straighteners (£93.49) and used these as curlers to add some loose wavy curls into my hair. Getting the nack of this can be quite hard, but you essentially use wrap your hair through the plate and around your straighteners, dragging the straigheners down your hair to create a curl. Once I had curled all of my hair, I finished the look with the L’oreal Studio Pro Lock It Ultra Strong Fixing Hairspray* (£4.49) and again this held the wavy curls all day, and helped to keep my baby hair flyaways tamed also! So that is the third and final look, which I was so pleased with as it transformed my usual boring half up pony tail into a hair look that I loved, and it took around 10-15 minutes to achieve! 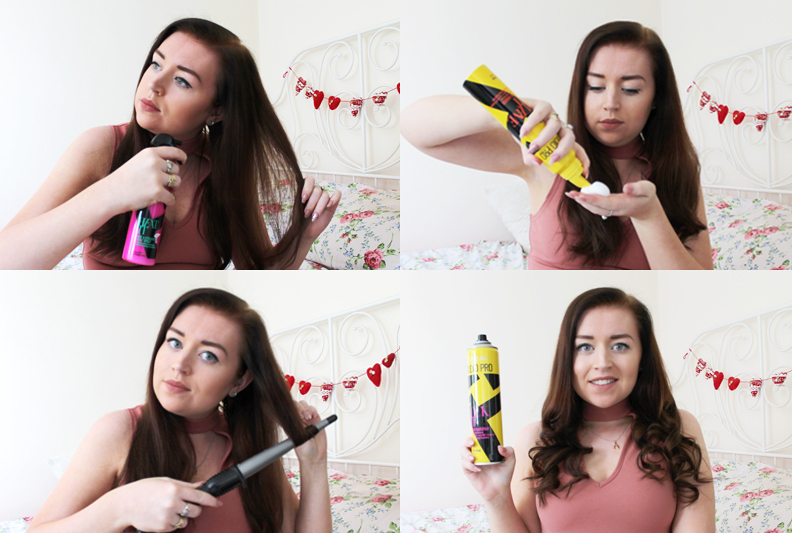 Overall I absolutely loved using these five products from the new L’oreal Studio Pro range to change up my boring everyday hair looks and to add some life into my hair styling! 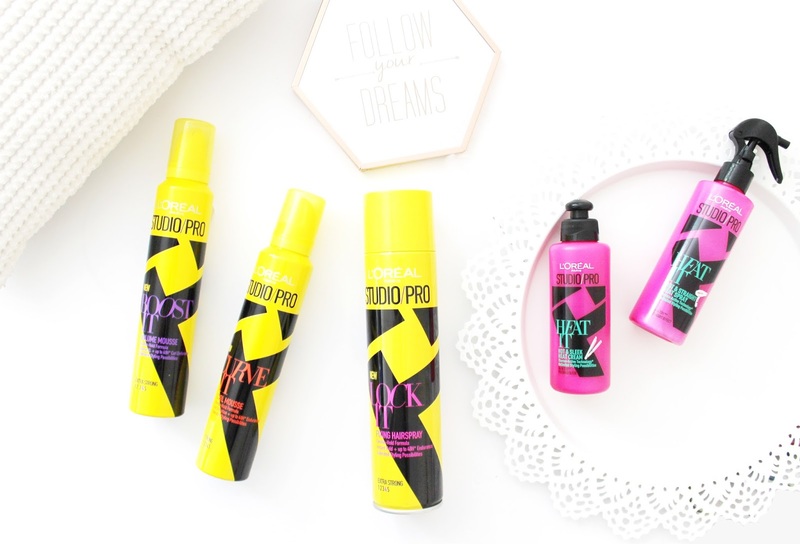 If you’re looking to transform your everyday hair looks, or are just wanting to try out some new hair styling products then I would definitely recommend trying out the L’oreal Studio Pro range as it’s not only affordable but works wonders in my opinion! 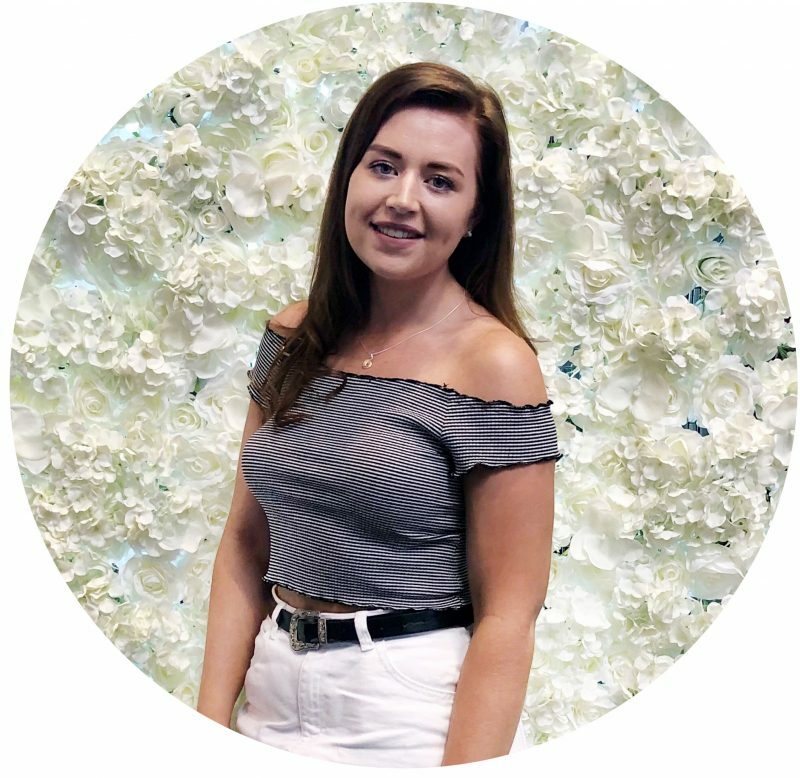 I hope you all enjoyed this post, as I had such fun putting this together for you guys and if you would like me to do any future hair looks then I happily will! What is your favourite go to hair look? * This post is in collaboration with L’oreal and Preen.me as part of the #PreenMeVIP program. See my full disclaimer here.